Watching judges as they survey an in-hand class of leggy yearlings, it’s tempting to imagine they have some sixth sense about which one could be the next Totilas, the equine phenomenon who breezed to three gold medals at the 2010 Alltech FEI World Equestrian Games. After all, they have a mere three minutes to assess the quality and correctness of each horse’s head, neck, saddle position, shoulder, frame, back, forehand, hindquarters and the angle and formation of the legs and joints, not to mention how it moves at the walk and the trot. ability of the horses before them. He likened the entire exercise to speed-reading. “You have to see a lot at once,” he said. Solyntjes should know: He has more than 30 years of experience, including 13 years inspecting mares and foals for the Oldenburg Verband in North America. But assessing a young horse’s dressage potential is fraught with challenges, said Hilda Gurney, an Fédération Equestre Internationale I-level judge, a USEF “S” dressage judge and an “R” dressage sport horse breeding judge as well as a renowned breeder and competitor. These older dressage prospects may offer more clues as to their potential in the high performance arena or even as successful mounts for amateurs. But the young horse classes provide tantalizing glimpses of what a talented foal might achieve with the right mix of training, care and opportunities. Licensed judges evaluate young dressage prospects in the United States through one of two avenues: the U.S. Dressage Federation Dressage Sport Horse Prospect classes for horses 3 years of age and under and the Markel/USEF Young Horse classes for 4-, 5- and 6-year-olds. Competitions such as these offer young horses exposure to the show atmosphere as well as the experience of being away from home. The USDF program also gives consumers an understanding of how to evaluate conformation and movement. Horses aged 3 and under are shown in-hand at the walk and trot. The classes are held on a triangle, so that the judge can view the horse’s movement from various perspectives. A handler on the ground leads the horse around the perimeter of a small triangle at the walk and then trots it around a larger triangle before returning to stand for the conformation evaluation. For most budding dressage mounts, work under saddle begins when they’re 36 months old; the materiale classes are open to 3-, 4- and 5-year-olds. Here the judges can see how the horse accepts the rider’s weight and leg as well as the rein contact. “The materiale classes can be really fun,” said Kristi Wysocki, a USEF “S” dressage judge and an “r” dressage sport horse breeding judge from Colorado. Although judges and spectators at a show featuring young horses should always be prepared for the unexpected, things can get downright dangerous. “There are times when you’re thinking, ‘I hope I live,’ ” admitted Wysocki, who is also the co-chair of the USDF Sport Horse Committee. When it comes to conformation, correctness carries serious weight—the theory being that the naturally well-balanced horse stands a better chance of moving efficiently and is less likely to be injured. The evaluation starts with the big picture: Is the horse built uphill, laterally balanced and proportioned from back to front? In dressage, horses must shift their weight to the rear during collection and rebalance that weight forward in lengthening, so a horse whose center of gravity is just below the saddle will be able to carry more weight in its hindquarters and move with less effort than a croup-high horse, whose center of gravity is farther forward. Judges look for a variety of characteristics, from a good-sized eye and an uphill neck to a well-developed loin and round feet with correct heels. But some features can be tough to assess early in a foal’s development. When performed well, the walk is a rhythmic and ground-covering four-beat pace; the horse should have a free shoulder with forward reach, an oscillating neck and an elastic topline. A lateral gait, in which the foreleg and the hindleg on the same side move almost in tandem, is severely punished in the scores, while lesser faults might include dragging toes, uneven length of stride and lack of freedom in the shoulder. “Foals tend to have short backs,” Gurney explained. However dazzling they may appear, huge walks can signal trouble later on, as the horse moves up the levels. “If you have a horse that naturally does a foot of overstep, how are you ever going to collect it?” asked Solyntjes. At the trot, the judges look for a clear, two-beat rhythm, impulsion emanating from active hindquarters, an elastic, swinging back, uphill balance and good articulation of the joints. Undesirable features include lack of rhythm or impulsion, trailing haunches and paddling or winging. At the canter, high marks are awarded to horses with rhythmic, uphill and balanced gaits that demonstrate a clear three-beat pace, with thrust and power coming from the hindquarters. Nevertheless, there are top equine athletes with movement imperfections who are transformed under saddle. “Totilas toes-in, and it’s worked for him!” offered Wysocki. Judges agree that one of the most valuable qualities a dressage horse can possess is rideability. Does he have a good temperament? Is he happy in his work? The willing, happy horse can overcome a host of imperfections. Dressage sport horse classes are judged on a scale from 0–10, and decimal points are permitted. In the prospect classes, movement is worth 60 percent of the total score (30 percent for the walk and 30 percent for the trot), with 30 percent reserved for conformation and 10 percent for general impression. In the materiale classes, conformation is not evaluated. Walk, trot and canter are each worth 30 percent, and general impression is 10 percent. Solyntjes said he begins with the premise that an uphill horse starts with a score of 8, a level horse starts with a 7 and a downhill horse starts with a 6. “Then you go from there. Maybe the horse is a little downhill, but it’s got a really good hip or hindquarters or good, strong joints or a strong back,” he said. In the in-hand classes, judges will usually allow a horse to go around the triangle a second time if it seems nervous or unsure. At the end of the day, the winning horse is the one that shows the best walk and the best trot and is in the best proportions. Usually, judges don’t know the bloodlines of the horses they’re evaluating, but even if they do, they aren’t allowed to use this information in their tabulations. Some mares, however, are hard to ignore, even if they don’t affect the final score. 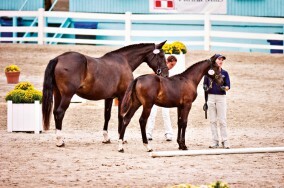 Solyntjes recalled a show when a beautiful foal entered the ring. Dressage breeding programs in the United States may not yet be in the same league as their Dutch and German counterparts, but over the past 30 years they’ve improved by leaps and bounds. For a dressage sport horse breeding judge, there’s nothing quite like watching a young prospect take a turn around the triangle and wondering if it might have a future international career. “It all boils down to impeccable rhythm, suppleness, elasticity and a good temperament,” said Solyntjes. What makes a dressage horse great, of course, is more than the rare combination of good conformation, stunning gaits and a willing nature. William Solyntjes and Kristi Wysocki will teach the 2011 USDF Sport Horse Seminar, scheduled for Oct. 29–30 at Majestic Farm in Batavia, Ohio.